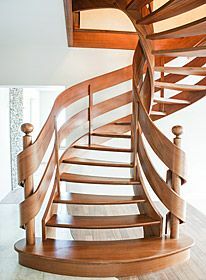 Stajder produces all types of wooden staircases. 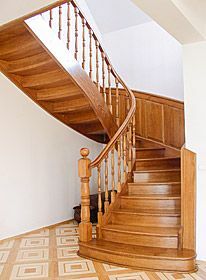 Looking at stylistic solutions, we distinguish classic and modern staircases. Classic staircases are characterized mainly by moderation and elegance. It goes without saying that they constitute a representative element of an interior décor. With Stajder staircases you are under impression that they admiringly change an ordinary cuboid of walls into a refined palace interior. The models of staircases offered by Stajder vary so that they can fit both huge living rooms and halls as well as houses with limited space. 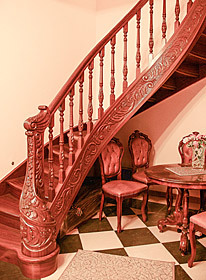 In classic staircases we would like to bring your attention to carved parts. The elements most richly ornamented are those of banister, i.e. balusters, handrails, and fittings. Solid balusters are decorated with imaginative carvings of rosettes, newels that accompany the banister can be covered with low relief that turn into a miniatures of artistic value. Additional vividness can be created, for instance, by adding a bent handrail. Modern models are no longer characterized by ornamented banisters but by their overall shape, brilliant location within the interior, surprising solutions and fine in its simplicity finishing of particular elements. 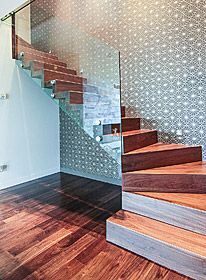 The staircases from this group fit perfectly in modern interiors where the unique special solutions dominate and where innovative finishing materials are used.